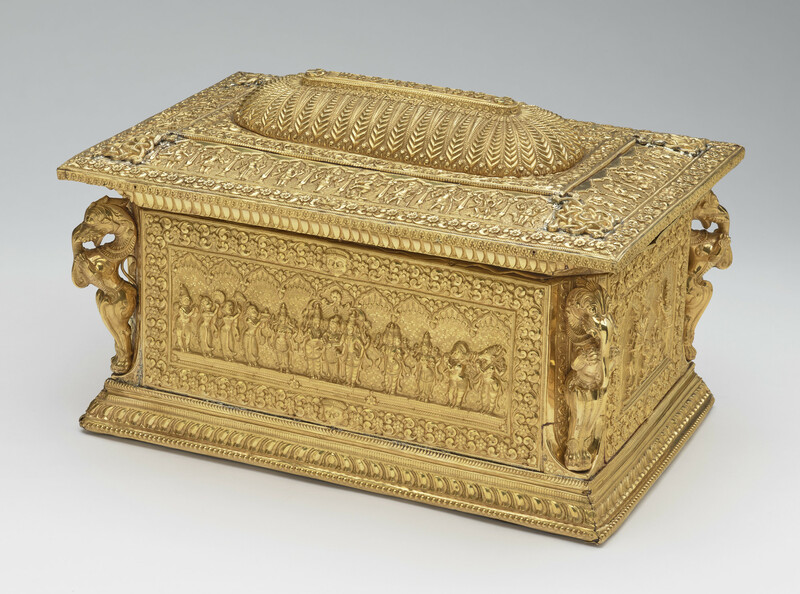 A sandalwood casket covered with panels of sheet gold worked in high repousse depicting Hindu deities within arcaded panels of floral borders. The panels on the side show scenes from the life of the Hindu goddess, Meenakshi, an avatar of the Hindu goddess Parvati (consort of the Hindu god, Shiva). Meenakshi is predominately worshipped in South India, particular in the city of Madurai where the Meenakshi Amman Temple is devoted to her veneration. The corners of the casket are decorated with elephant-headed lions, known as yali which are depicted in South Indian temple carvings. The most notable architectural example of the decorative use of yali is the 'Hall of a Thousand Pillars' in the Meenakshi Amman Temple complex, where stone pillars are carved in the round to resemble elephant-headed lions. In the nineteenth century, depictions of Hindu gods and goddesses in gold or silver were described by European observers as swami (god) decoration. These depictions were traditionally worn as amulets or used to embellish ritual objects in India. The increased European presence in India in the latter half of the nineteenth century and demand of objects of 'traditional' Indian design by European collectors encouraged Indian metalworkers to apply these motifs to objects of western form and use, such as tea sets, tankards and caskets.